For the last three portions we have been seeing the story of Joseph unfold. Up until now we have learned the main events of Joseph’s life. We learned about Joseph’s descent into Egypt through the seemingly unfortunate circumstances initiated by his brothers’ hatred toward him. But then we saw how God used this for his own purposes, placing Joseph in a strategic position to be not only the savior of his own family, but of the world as well. We read about the reunion of Joseph and his family, and how he moved his father and all of his brothers down to Egypt so that he could take care of them. 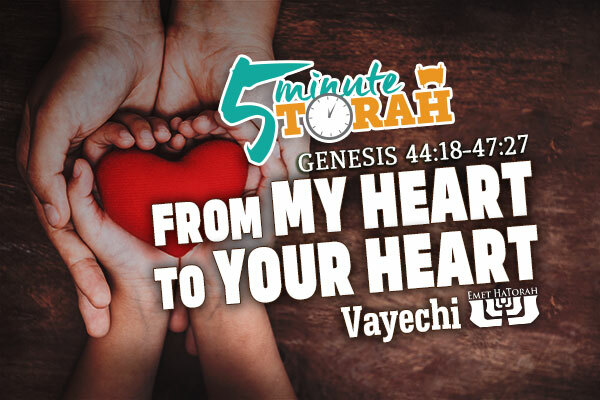 Now, in our final portion from the book of Bereisheet (Genesis), we learn about the final days of Jacob and his desire to bestow his blessings upon his children before his passing. The focal point of this portion is the individual blessings he gives to each of his sons, with the adoption and blessing of Joseph’s sons, Ephraim and Manasseh, being an unexpected turn of events. We are told that Joseph “comforted them and spoke kindly to them” (v. 21). However, our English translations don’t fully capture what the Torah is saying here. Virtually all English translations say that Joseph “spoke kindly to them.” However, the phrase the Torah uses is vay’dabeir al-libam. A more literal reading of the Hebrew is that Joseph “spoke to their hearts.” What does it mean to speak to a person’s heart? It means to connect with them intimately. It means to speak to them from one’s own heart. There is an oft-repeated Jewish expression that says, “Words from the heart enter the heart.” This is a statement of fact. When we speak from our hearts, others are receptive to our message and it enters their hearts. How do we ensure that our hearts are spreading light, rather than darkness? If our hearts are filled with Torah and the teachings of our Master, then we will be filled with light. We need to have a constant diet of these things in order to illuminate our hearts. Otherwise, darkness will overtake us. When we speak to others are they hearing our words or hearing our hearts? We should be speaking from one heart to another—from my heart to your heart. Only then will our hearts be one, united for the purposes of the Kingdom.